How long does it take for you to set up my account? Please allow 1-2 business days for your account to be set up and approved. If you are interested in our Discount Program, additional time may be needed for the contractual agreement. Why do you require a Tax ID number? A Tax I.D. is required in order to confirm that you are a qualifying business. Can I get plastic and eGift cards? Yes, both plastic and eGift cards are available and can be placed in the same order. Is there a minimum gift card order? Yes, the minimum order is $1,000. Which gift card denominations are available? You may choose any denomination from $5 - $500 in $1 increments. Can I order mixed denominations in the same order? Yes, your order can include any number of cards in any denomination. Does the gift card's value appear on the face of the card? No, the value of the gift card does not appear on the card but you can check the balance of your gift card online. No denominations appear on bonus cards. When will my eGift card order be ready for download? You can download your eGift cards on the same business day as you place your order. Can The Cheesecake Factory donate gift cards to my charity or non-profit organization? Individual locations may donate gift cards or product to non-profit and charity organizations. Please inquire at your local restaurant. Bonus cards are non-denominated gift cards for The Cheesecake Factory. You may choose a denomination from $5-$50 in increments of $5. Bonus cards have a maximum balance of $50. 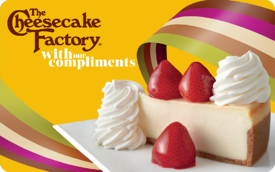 Your complimentary Gift Card (“Card”) can be used at any of The Cheesecake Factory® restaurants in the United States of America, including the Commonwealth of Puerto Rico. This Card is subject to all state and federal laws and regulations, which may change from time to time. Therefore the terms and conditions affecting this Card are subject to change without notice. Can I receive bonus cards in mixed denominations? Bonus cards are only available in single denominations. If the face value of your order is not evenly divisible by the selected denomination, then any remaining value rounded to the nearest whole dollar will be automatically added to an additional bonus card. Can I receive bonus cards in a denomination larger than $50? No, bonus cards have a maximum value of $50. When will my gift card order be shipped? Once payment is confirmed, all gift card orders require a two-day processing period before they are shipped. Note: Delivery times may be longer during peak seasons. A gift card order can only be sent to a single address. You may place several orders, each shipping to a different address. How do I pay for my gift card orders? All Small Business customers must pay via credit card. All major credit cards accepted, including: Visa, MasterCard, Discover, and American Express. All Corporate Volume customers must pay via ACH. Payment must be received before the order can be fulfilled. I changed my mind. Can I get a refund? Sorry, no refunds are available. Where can the gift cards be redeemed? The Cheesecake Factory® Gift Card (“Card”) can be used at any of The Cheesecake Factory® restaurants in the United States of America, including the Commonwealth of Puerto Rico. Can the gift cards be redeemed for cash? Gift cards are not redeemable for cash and cannot be returned for a cash refund unless required by specific state law and only in restaurant. Is there an expiration date on the gift cards? No, gift cards have no expiration date. Are there any fees if the gift cards are not used? No, gift cards have no dormancy fees or other fees. What are the Terms and Conditions for use of The Cheesecake Factory Gift Cards? The Cheesecake Factory® Gift Card (“Card”) can be used at any of The Cheesecake Factory® restaurants in the United States of America, including the Commonwealth of Puerto Rico. • Please safeguard this Card as it cannot be replaced if lost or stolen • The Card does not expire or accrue fees. • Except where required by law, this card cannot be refunded or redeemed for cash • Card balances cannot be transferred onto or used to purchase other gift cards • Where prohibited by law, you cannot use this Card to pay for alcoholic beverages • Use of this Card constitutes acceptance of these terms and conditions • Card only valid in the United States of America, including the Commonwealth of Puerto Rico • This Card is subject to all state and federal laws and regulations, which may change from time to time. Therefore the terms and conditions affecting this Card are subject to change without notice. To find The Cheesecake Factory® restaurant nearest you or check the balance on your Gift Card, please visit us at thecheesecakefactory.com. You may also check your Gift Card balance by calling 1-888-891-2429. The Cheesecake Factory® electronic gift card (“eCard”) can be used at any of The Cheesecake Factory® restaurants in the United States of America and Puerto Rico. • Please safeguard this eCard as it cannot be replaced if lost or stolen • The eCard does not expire or accrue fees. • Except where required by law, this eCard cannot be refunded or redeemed for cash • eCard balances cannot be transferred onto or used to purchase other eCards or gift cards • Where prohibited by law, you cannot use this eCard to pay for alcoholic beverages • Use of this eCard constitutes acceptance of these terms and conditions • eCard only valid in the United States of America and Puerto Rico • This eCard is subject to all state and federal laws and regulations, which may change from time to time. Therefore the terms and conditions affecting this eCard are subject to change without notice. To find The Cheesecake Factory® restaurant nearest you or check the balance on your eCard, please visit us the Website. You may also check your eCard balance by calling 1-888-891-2429. © 2008-2019 TCF Co. LLC. All Rights Reserved. Powered by GiftCard Partners, Inc.